Is it just the fee? Or do these opera luminaries really love the billing? Didn’t he used to sing with Jackie Evanco? Woah!! He has a beautiful voice and a lovely face and if you like that type of music I’m sure it’s a captivating combination. Your comment was totally out of order. I’m a bit sleepy here in The City…. Nope. In my opinion it isn’t. With marmite one talks about taste. With Bocelli we talk about singing – and there are certain criteria to judge singing – like intonation, range, technique, volume and so on. Timbre is a matter of taste, but if someone manages to change from the breast- to the head register and back without the listener noticing it, isn’t connected to taste, but to skills. What rubbish! Beautiful voice forsooth! A vibrato like a ‘singing’ goat! Ave Maria and Panis Angelicus – at our last British Royal wedding. Americans just seem to.live him. go ahead and try to sing erich. Let’s have a listen to your voice before you complain about Bocelli. Anger and vitriol are really quite ugly and unnecessary. Ah the old “If you can’t sing as well as the person you’re criticizing…you have no right to criticize.” There go all the music critics, sportswriters, and even most political reporters. Sorry, but this argument “if you can’t do it at least so well as the person you criticize, you shouldn’t criticize” I’ve always thought rather wrong. I got it in horse riding – and even if I can’t write the High School lessons, I can very well see if they’re done correctly. And though I can’t sing (anymore) because of a “lame” vocal cord – I studied music (and even some singing – my poor teachers! I’m sure they only let me through the exam to get rid off me), I sat for some time in the pit of one of the great opera houses, I’ve heard a lot of real good singers (just imagine: The first Wagner opera I saw was produced by Wieland Wagner and sung by Wolfgang Windgassen). I think I know what I’m talking about and being not a singer myself gives me perhaps the necessary distance – which one always should have when judging. Having heard live accoustically at Richard Tucker gala concert. He really cannot sing! No projective, no timbre and nothing else. When he opened his mouth the audience gasped in surprise at lack of voce! Oh, yes, and equally bad singing of another Ave Maria at the Croke Park concert for the Pope in Dublin. Oh my God, deaf and blind, that’s too much for one person! Poor Sue….. If you like “that type of music” you probably like Liebfrauenmilch too. Nothing wrong with Liebfraumilch as a desert wine. That’s just wine snobbery putting it down. As for Bocelli, that’s not snobbery, just using one’s highly trained ears. Perhaps I’m a wine snob – if so I can’t help it, I’ve got some wine growers in my pedigree. Hence I wouldn’t even drink Liebfrauenmilch as desert wine. Not as long as they’re things like Eiswein or Trockenbeerenauslesen. In the desert it would probably be highly welcome…Liebfraumilch that is! That’s definitely true. In the desert even I’d drink the stuff while in my dessert I really don’t want it. thank you for the attention you paid to my modest person. As for the voice of Mr. Bocelli I think there are a lot of qualified opinions describing it unbiased and right …. PS Yes , my face is rather ugly now, after about 2 years of feeling unwell, hopefully time will improve that imperfection of mine soon to the better side …. Nasty comment and uncalled for. I’m not a fan, but I would never deny Bocelli’s physical and popular appeal. Events like this support Bocelli’s delusion that he is, in fact, an opera singer. I hope it is a charity event with the proceeds being donated to the charity for visually impaired , if there is such a thing. he is okay in crossover pop music, but he should not attempt singing opera. It’s the shameless fee and the opportunity for promotion to the bottom of the barrel. Who in their right mind would want to share a stage with an impostor? Well, obviously many have and do: Gheorghiu, Gergiev, Fleming, Martinez, Mehta, Netrebko, now Garifullina, Sierra, Leonard. Who else? To answer my own question: Domingo, why of course. And why don’t we wonder? I think Domingo would have done a gig with the Spice Girls if he’d have got enough money for it. John Denver wasn’t as horrible as Domingo sen. and Domingo jun. singing this song! That was really music for a horror movie! Don’t go knocking John Denver now. Alan Gilbert with the NYPO at Central Park. There you go. I see the list keeps expanding. How have you not choked on your own bile? are in one way or another by products of money .Whether it is the exalted Mozart to the imposter money controls all . It’s what you are willing to exchange for your buck that makes the difference. those willing to sell themselves on the cheap . It’s worth remembering, too, that Mozart would interpolate arias if the original aria wasn’t a big hit, or if the singer in a new production wasn’t suited to an aria written for the originator of the role. Hence all those concert arias. It wasn’t “Deh vieni” that was replaced. It was an aria in Act 2. The usually performed “Venite inginocchiatevi” in Act 2, where Susanna dresses Cherubino, was replaced by Mozart’s alternate, “Uno moto di gioia.” HWSNBN made an unholy fuss about it and wanted to refuse Bartoli but she insisted. Legitimately and defensibly, IMO. You don’t want to compare Mozart (or Bach who interpolated a lot of his work) with Bocelli and his producers, do you? Why should a fee paid to artists, whatever the amount, be a cause for shame? How nice of you to advertise one of my books! But couldn’t you perhaps next time take one which isn’t out of print? Are they available in other languages? Unfortunately not. In other languages one only gets some of my horse books (they are translated in English, Dutch, French and Estland [and they never paid the fee for it -grmpft]). Well, you’ve started to talk about my books. I’m wondering: What’s the fact that Ms Binder has written children books to do with her opinion in matters of music? Do you think authors are per se nonmusical? Or do you think the writing of children’s books is something indecent? Besides: Ms Binder’s children books, especially the one you’re mentioning here, were rather successful. The publisher house doing them is well-known and rather big, the book was part of a series with 12 volumes (and if the books wouldn’t have sold well the publisher house certainly wouldn’t have printed 12 volumes). But I’m pretty sure, Ms Binder will appreciate you make PR for her œuvre, what contents about 90 books now, most of them for adults. The motivation behind this may be the welcome combination of a) an anti-elitist gesture to a broader audience, saying ‘we as classical singers don’t look down on you’, and b) a nice fee. The defense of virtue mostly comes at a cost, but this particular ‘virtue’ of anti-elitism works the other way. Whores. And I don’t use that word lightly. It will be on their resumes forever. But, heck, for some it may be the most interesting accomplishment there. Was tiredofitall just aloud to call them whores!? Are these comments not moderated? Fine, but what about those who find his concerts disappointing and decide that “opera”, as delivered by him, is not all it’s cracked up to be? A know a couple who were looking forward to a heavily promoted performance of Tosca at the Royal Albert Hall a few years ago. They were very unimpressed. In particular, they were expecting the live performance to be an improvement on the recordings they normally listened to. Unfortunately, the performance was not really “live” in any real sense and, according to some reports, the amplified orchestra (why?) sounded like a cheap stereo suspended from the ceiling. So much for attracting new audiences. Of course. If one doesn’t like a popular singer one is “narrow-minded”. Well, I do like a lot of popular stuff, but I strongly dislike Bocelli. He attempts to show himself as a serious “opera singer” and that he certainly isn’t. He lacks voice, technique, timbre, musicality. He is in short a kind of “impostor”. The argument that he would make people interested in opera I don’t believe. 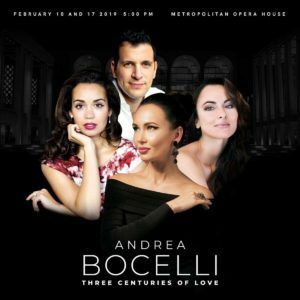 Someone who goes to the opera because he likes Bocelli will go only once – and then he’ll go home disappointed and probably bored because opera isn’t as “quaffable” as Bocelli (and Liebfrauenmilch). Spot on, Sibylle! What Bocelli does is not opera. Far from it! “Artists” like him actually miseducate the public, and that’s a shame. This is patently false and I am a testament to it. Omg. I have friends who have attended Bocelli concerts who are not opera fans. He does have a large following. What is so upsetting about drawing more people into the met house to hear opera singers that is upsetting you all? I don’t get it. I totally agree John. I’m an opera newbie BECAUSE of AB. I enjoyed the show Sunday night and will now be exploring other operas I can attend. The Opera community should be so grateful to AB as he is the entree into this music for millions. I find it hard to believe that this madness actually happened! Gergiev, Fleming, Borodina and this creature on stage together??? And singing this? Good gracious… It is just outrageous. Wonderful text from Norman though! I’m sure it’s the money and also I get the sense many of these musicians don’t want to be seen as snobs. I’m sure most of them have an inner snob that is secretly revolting at doing something like this but they suppress it. It makes me grateful for the musicians who have standards and are willing to live by them. If I was a good enough singer to sing in the major opera houses I would not give two hoots about “standards” in respect to singing with Bocelli. He has an audience and many people like hearing him sing. Sure, he is not a particularly good singer, but so what. If I was a major singer I would be happy to get a nice fat fee, and to have the chance to sing to a new audience who would not normally hear a proper opera singer. You answered your own question. It’s the fee. Those performers will do virtually nothing to be the warm ups and fillers for a man they slam in private (trust me the entire opera world does) but when they hear the cash registers ring he’s suddenly “darling”. I wouldn’t waste my time attending this if you gave me a ticket. But if it raises money for the Met I have no problem with it. But if it is a fundraiser why aren’t these artists donating their services? These singers should be ashamed of themselves. No money in the world is worth sharing a stage with this impostor! And, even worse, they are not exactly starving, are they? If her beautifully curated Instagram page is anything to go by, Nadine Sierra seems to genuinely enjoy sharing the stage with Bocelli. She sings arena concerts with him. I’m sure the fee doesn’t hurt.